I loved the challenge of making a few recipes out of last month's Saveur magazine, that I made this practice one of my New Year's resolutions! I love trying new things in the kitchen and this might just be the motivation I needed. For this month I had to peruse the Chef's Edition, The Saveur 100. So many recipes and techniques to choose from, but a lot required a massive amount of ingredients I didn't have in my cupboard, or out of season foods. Plus with all this snow, I wanted simple and comforting. Enter Porchetta's Sara Jenkins' Pasta Alla Norma, and Sara Moulton's French Apple Tart. I've heard that those of us who do make some of our meals tend to rotate the same recipes. Of course, this leads to much palate fatigue and boredom, something I was experiencing recently. I need new, simple, mid-week dinners that taste good, are quick to whip up, and don't cost a fortune. Eggplant is not usually a vegetable I find myself using at all, so when I read this pasta recipe using roasted eggplant, I was curious to how it would taste. The dicing and roasting was extremely easy, even though I halved the recipe and didn't bother mixing the eggplant and oil together in a bowl. I also substituted my leftover mozzarella cheese for the ricotta salata. And this was one great pasta dinner. 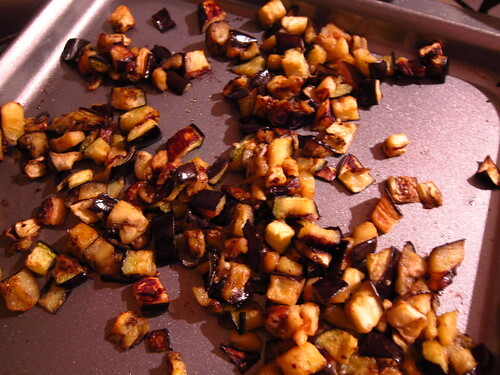 The roasted eggplant added a nice vegetable flavor to the mix, a good option for those who want something meat-less. 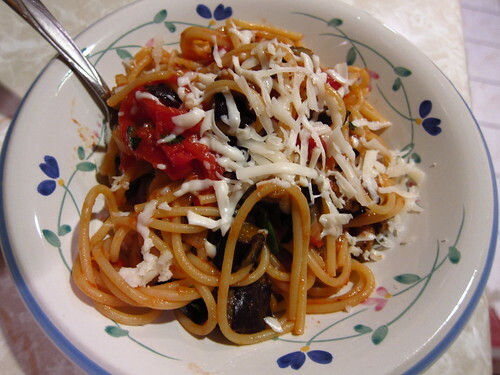 By making a sauce mainly from the tomatoes, it covers the pasta nicely, but doesn't smother it. I think I've found a new recipe for my rotation. 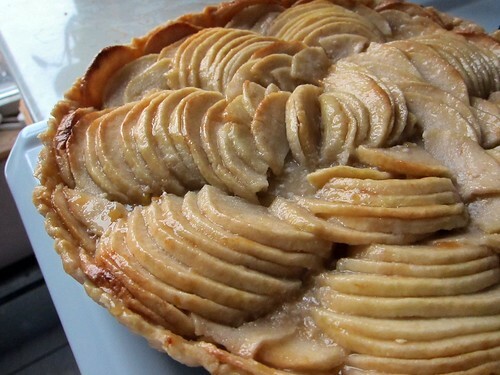 French Apple Tarts are the dessert of my baking nightmares. I've always wanted to make one, but I've been terrified of making the rose pattern. It just looks intimidating for anyone less than a professional! Luckily, the wonderful Sara Moulton (she's one of our idols!) gave the readers a technique cheat sheet. My rose didn't come out looking anything like a rose, but at least I tried. 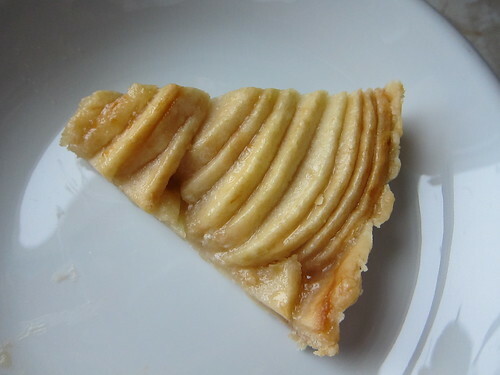 I learned that I need very slim slices and smaller apples for the next tart. My one caveat about the recipe is how the ingredients are listed, be sure to keep your butter split into 8 tbsp and 4 tbsp. If you're like me, you'll cube all 12 tablespoons and then realize the split. I best guessed it and didn't tell anyone of the mishap. The tart must have came out spectacularly since it disappeared in less than 15 minutes. Your French Apple Tart still looks amazingly tasty, rose or no rose! So BEAUTIFUL! Just got my Jan/Feb issue today.